In the olden days, when our customers were mainly bars just transferring the odd bottle of spirits between venues, a single item transfer system was enough. Since then our customer base has grown and diversified, and it recently became apparent that the old system simply wasn’t going to cut it for operators with central kitchens and the like. 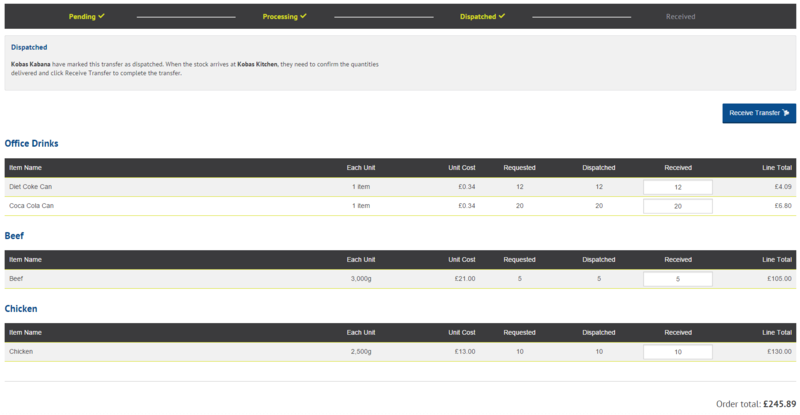 As a result, we’re very happy to unveil our new bulk transfer features in Kobas Cloud. Built from the ground up in close collaboration with our customers, we now have a brand new full transfer request and fulfilment system, which allows us to support every scale of stock transfer between venues – from a single ingredient to a batch of products. Starting with a transfer request from a venue, through processing and dispatch at a central kitchen or second venue, to the stock being received at the requesting venue – the complete stock transfer process can now be managed in real-time from within Kobas Cloud. With a slick and easy to use interface, the new tools revolutionise the stock transfers and pave the way for us to do some really exciting things with the feature set in future. In additional to this major new functionality, we’ve combined the order and delivery sections, giving our users a smoother and more joined up experience when carrying out these tasks. We’ve also touched upon reports, bringing you a new, more informative version of the Stock Transfers report and an update to Stock Current Position to better cater for ingredients contained in products. Finally, as ever we’ve tweaked and polished various other small things around the application, so it’s generally a nicer, smoother place to be. Overall this release builds upon and polishes our stock management offering significantly, giving great increased value from Kobas to our customers. For full details on how to use the new transfer functionality and its behaviour, see our new guide.